I have been trying to knit up some of my handspun. I have accumulated a lot of it since I started spinning five years ago, and with another Tour de Fleece under my belt, and my second Spinzilla looming, the handspun is really piling up. But lo and behold! I have made a tiny dent in the stash. None of these items has been washed yet; heck, not all the ends have been woven in yet. But the knitting is finished, so I count these as FOs that qualify for the Happy Dance. When I finished these mitts, I still had a fair amount of yarn left, so I knitted a matching ear warmer. 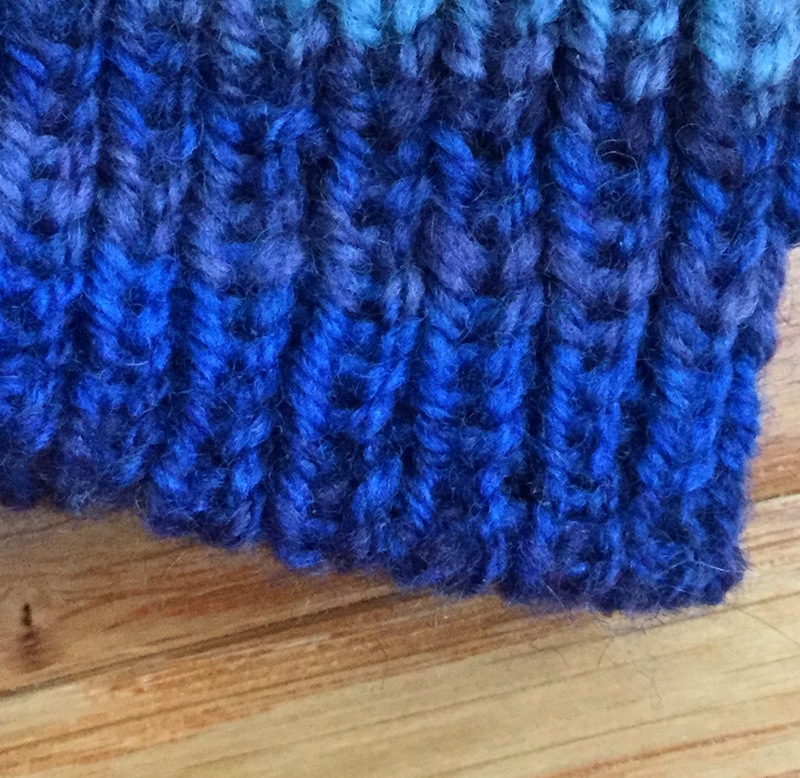 The stitch pattern was borrowed from Claire Devine’s Everyday Brew Hat. The yarn is my handspun from 2012. It’s some of my earliest wheel-spun yarn using Corriedale pin-drafted roving from Sunset Fibers. It was the October 2012 selection from the Fiber-of-the-Month Club. As you can see, these mitts weren’t quite finished when I photographed them. One of them still needed a thumb. They are completely finished now, but I’m too lazy to take another picture. I call these the Pittsburgh Skyline mitts, so named because the colors remind me of the colors you can see in the Pittsburgh skyline as viewed from PNC Park as day changes to night. The handspun is Falkland from Into The Whirled in the color way 24-1/2th Century. 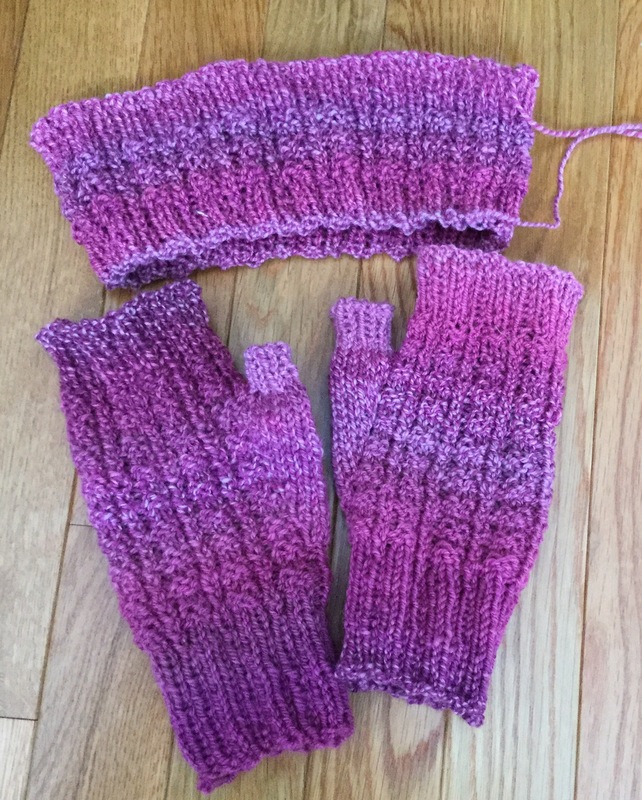 The pattern is just a 1 x 1 ribbing using my standard worsted-weight yarn mitts template. I started with a tubular cast on, which works very well for 1 x 1 ribbing. I think it looks fantastic, and it is very stretchy. This is the bound-off edge. I’m not very good at doing a tubular bind off because for some reason, I always get the edge too tight. 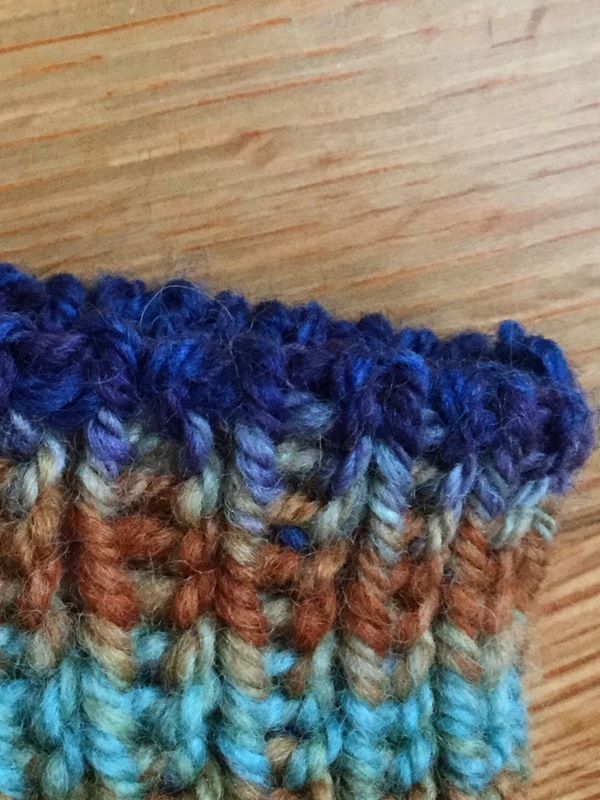 But a search of YouTube turned up an invisible 1 x 1 bind off that looks just like the tubular bind off but without the double knitted part. It’s easy to do, and I can do it without making the edge too tight. 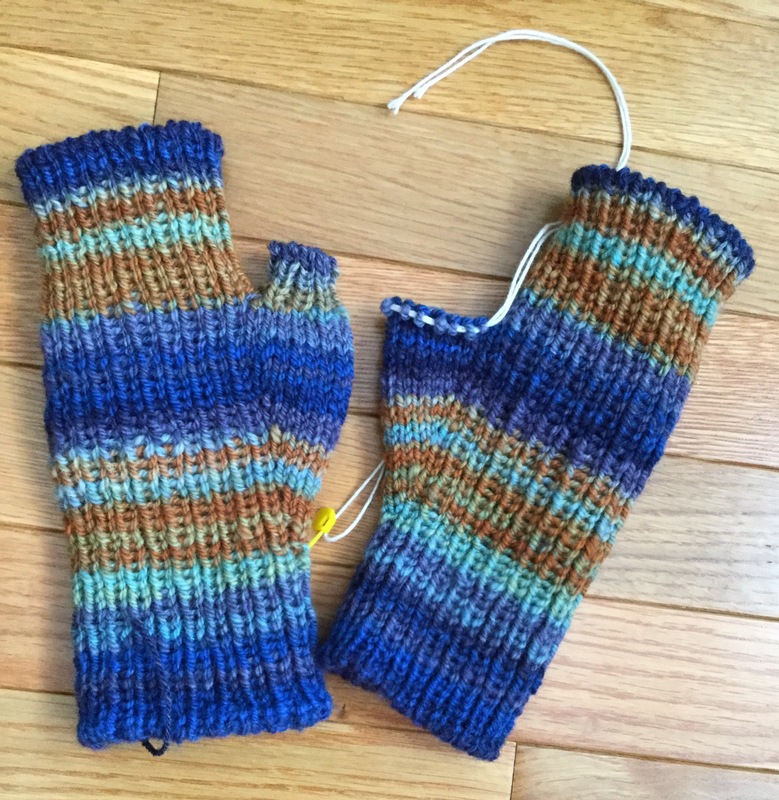 This entry was posted in Fingerless Mitts, Knitting and tagged knitting with handspun yarn. Bookmark the permalink.